I used to live by the Big Dam Bridge, and over the years I have made a ton of trips there. 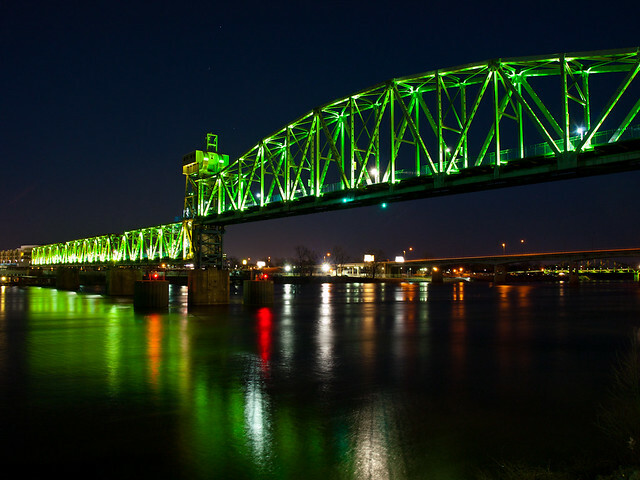 But I haven’t been to the bridge since I moved across the river to Little Rock last year. So last week I grabbed the camera and went back to my old stomping grounds. It had been pouring down rain all day, but the clouds were breaking apart and there were a few people out at the bridge walking and fishing. I walked out to one of my favorite places to get pictures of the bridge. A little stretch of concrete juts out into the river, just below the dam. The river was running high, and the muddy water churned past the rocks sitting below the concrete. 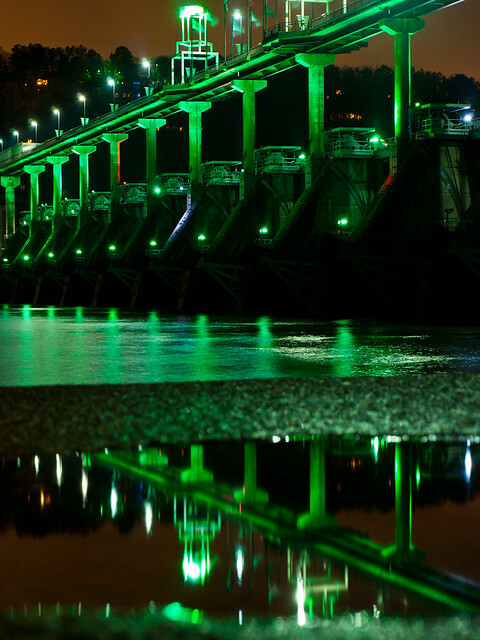 The recent heavy rains had left a few puddles in the concrete, which provided a nice reflection of the bridge and the lights (still green for St. Patrick’s day, I guess). Last Sunday I had some free time so I decided to drive around Little Rock trying to find something to take pictures of. It was a lazy day, most of downtown was quiet and still. 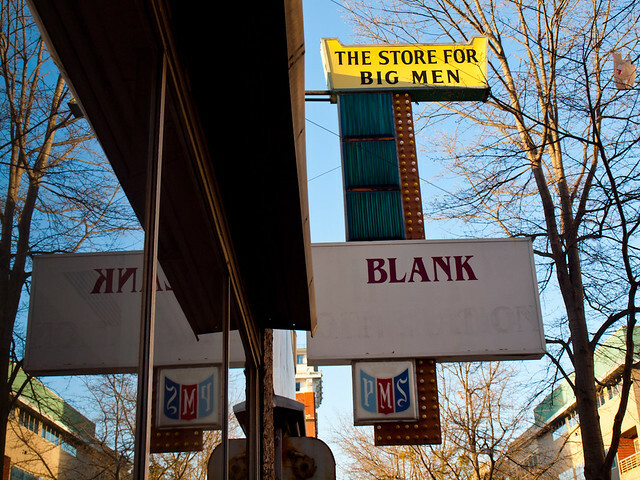 This is an old sign along an empty store along Main Street. The Arkansas Repertory Theatre was just across the street and there was a crowd of people streaming in to see a show. Although this storefront was vacant, there is a lot of new activity along Main Street. There is a lot of new development coming in that is bringing life to this forgotten stretch of downtown. I drove across the freeway and went by the old Woodruff House. Located along East 8th Street, the Woodruff House was built in 1853 and is one of the oldest buildings in the city. The house was built for William Woodruff, who was the founder of the Arkansas Gazette. Back in 1850s, this area was located outside of the city limits and Woodruff built a country estate. During the Civil War, the Union Army took possession of the house and used it as a headquarters and as a hospital. The Woodruff family moved out of the home, and in the 1920s it was converted into apartments. 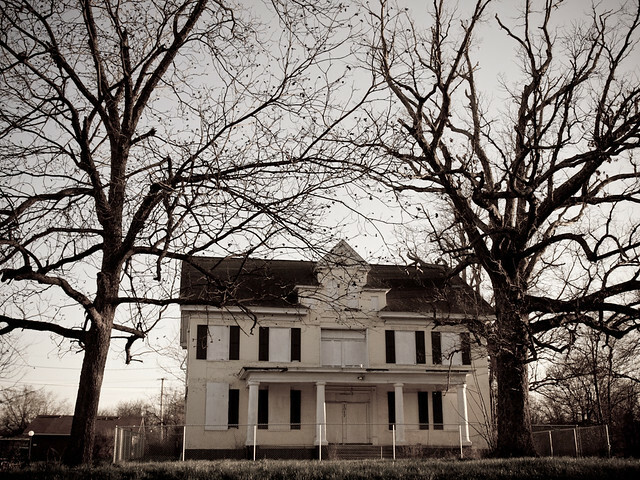 It has long since fallen into disrepair and has been vacant and boarded up for years. 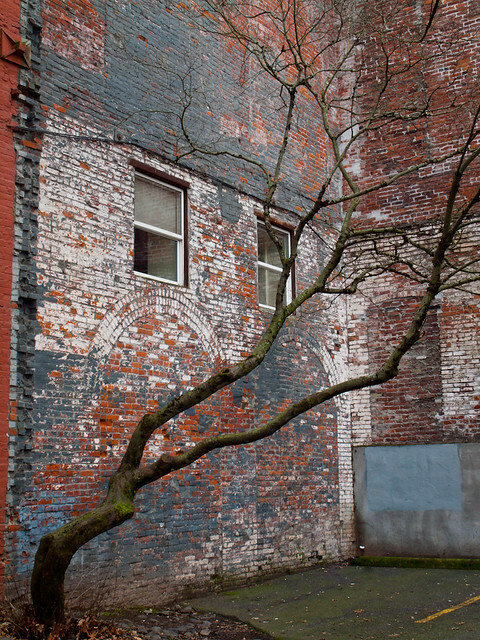 There have been a few attempts to save the building, and it is listed for sale right now (only $175,000). Hopefully someone will step in to help save it. After the old Majestic Hotel burned in Hot Spring, we don't need to lose anymore of our historic buildings in this state. I drove around some more, eventually stopping by the old Cathedral of St. Andrew. It's a pretty old church, built way back in 1881. Here it is reflected in the roof of my car. I'm not too pleased with this composition, since you can some hail damage on my poor car. Another church nearby is the First United Methodist Church. 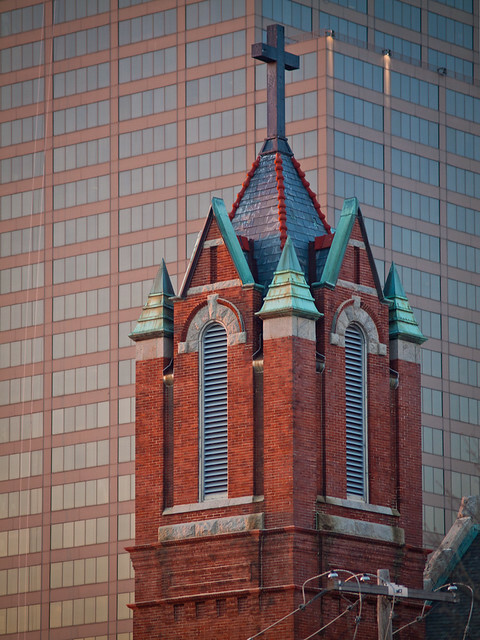 Here is the steeple of the church, which was built around 1900, with the modern Metropolitan Bank Building in the background. 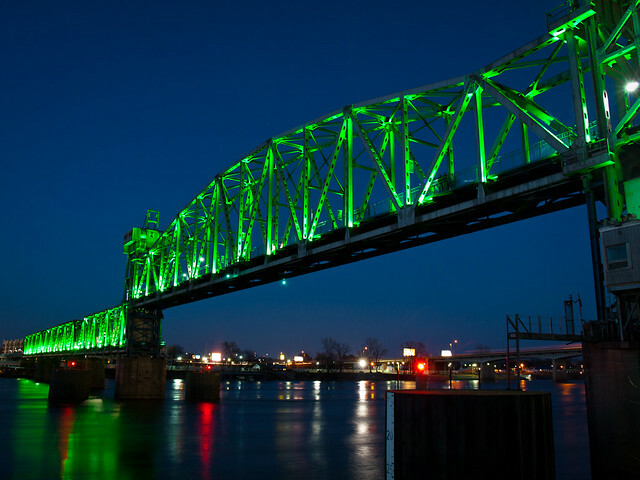 I headed into downtown Little Rock to get a few pictures of the Junction Bridge with green lights, in honor of St. Patrick's Day. I was out there for an hour or so and then hurried back home to drink some Guinness. 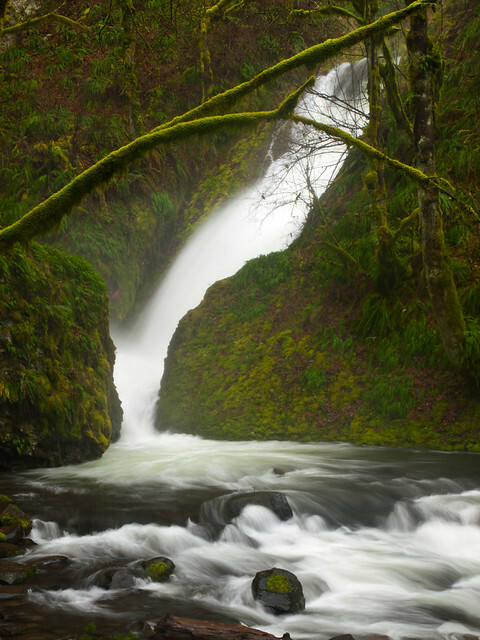 On our last day in Portland, I was able to make another trip out to the Columbia River Gorge. It was on a Sunday afternoon, and since it was the weekend the waterfalls were completely packed with people. I drove by Multonah Falls and didn't even bother to stop. It was packed with people, I doubt there would have been any room to walk up there. I drove over to one waterfall I really wanted to see, Elowah Falls. And since you have to do a hike to reach it, I figured it wouldn't be as crowded as the falls that you can see from the road. There were just a few cars in the parking lot, and I only met a few other people on the trail. 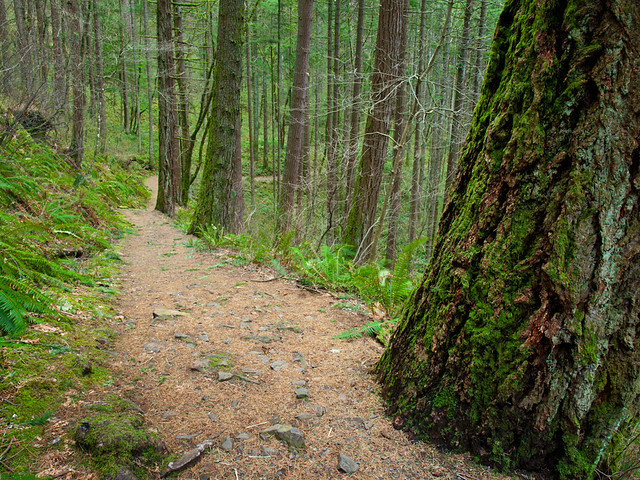 The trail to Elowah Falls is short, but requires hiking up a hill and then switchbacking down to the falls. 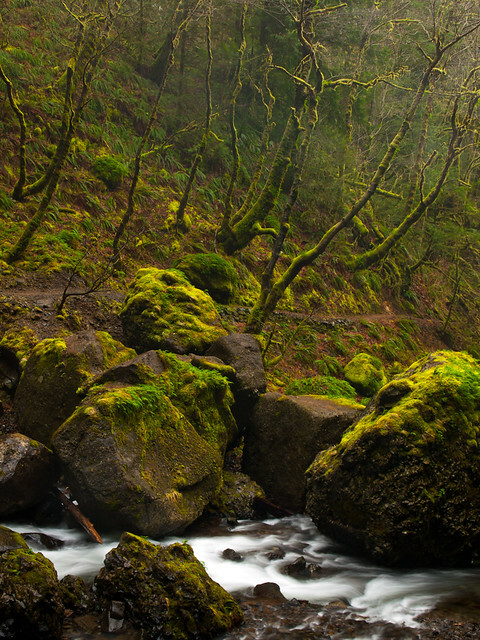 It's a pretty hike through a mossy forest. 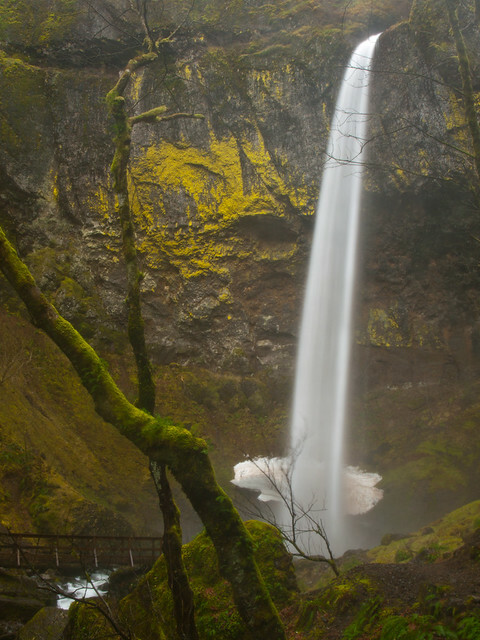 Elowah Falls is 289 feet tall, dropping down a basalt cliff into a pool surrounded by boulders. 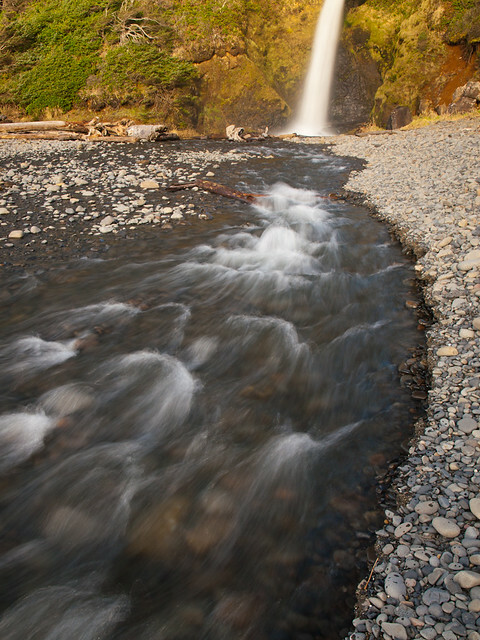 The creek below the falls. The spray from the falls was so strong that it flow and move down the creek like a fog. 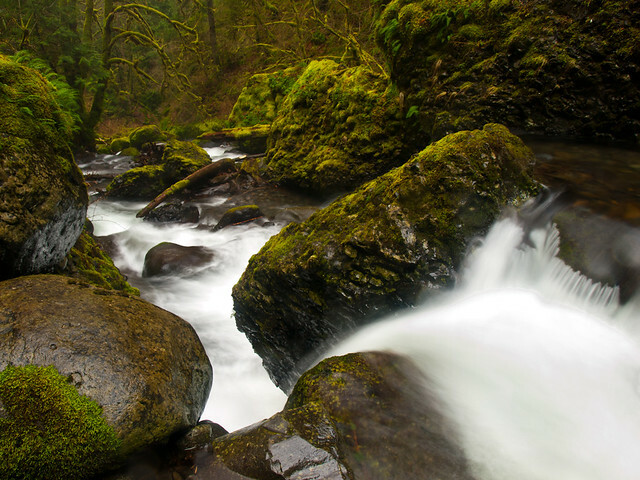 This is my favorite waterfall out of the many waterfalls we saw in Oregon. 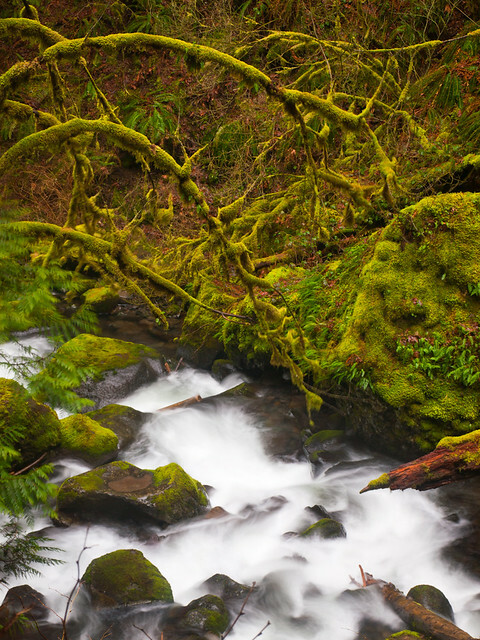 I really liked how you got to see more of the creek below the falls, as it flows past rocks and trees covered in a carpet of moss. The next day we headed out to explore Portland. 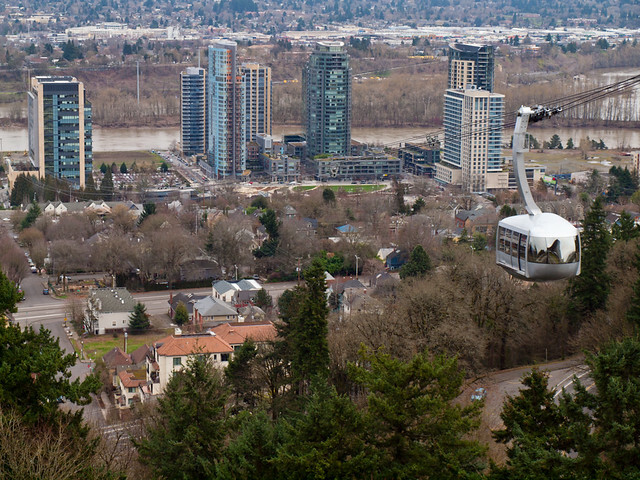 After breakfast at Mothers, we drove over to the South Waterfront District to take the Portland Aerial Tram. The tram is one of only two commuter trams in the country, and connects the waterfront with a hospital. The ride is short, only lasting a few minutes. 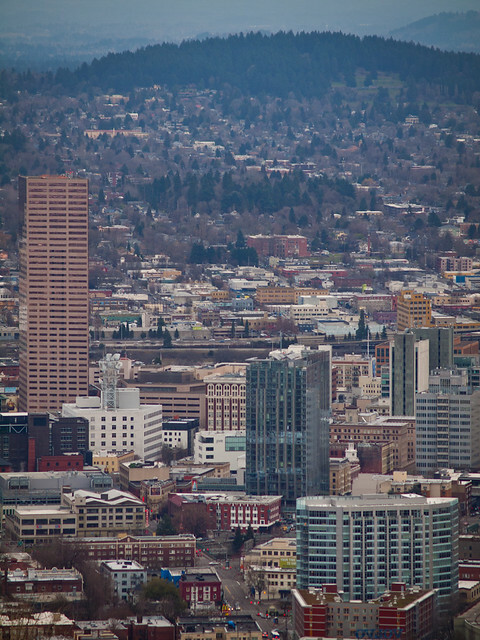 But it does give you a good view of downtown Portland and the mountains in the distance. From the tram we drove north into Washington Park. 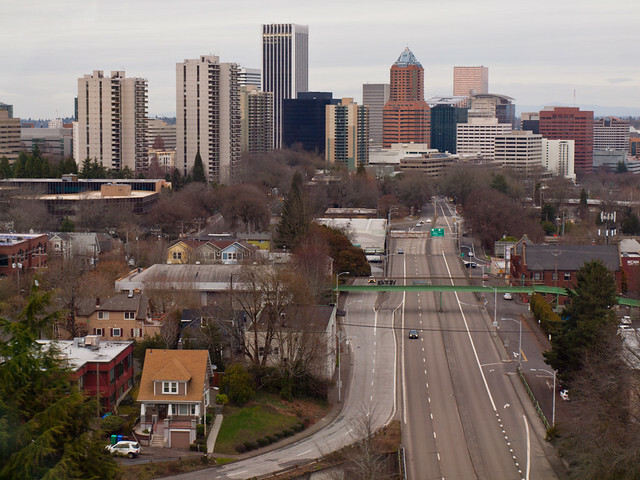 Portland is famous for its roses, but since it was late February all of the roses were dormant. So we headed over to the Pittock Mansion, an mansion that was built in 1909 on a hill overlooking the city. The mansion is open for tours, but we instead went to the back to check out the view of Portland. You should usually be able to see Mt. Hood from here, but it was too cloudy. I was also excited to be there since the mansion was the finish line in the 13th season of The Amazing Race. 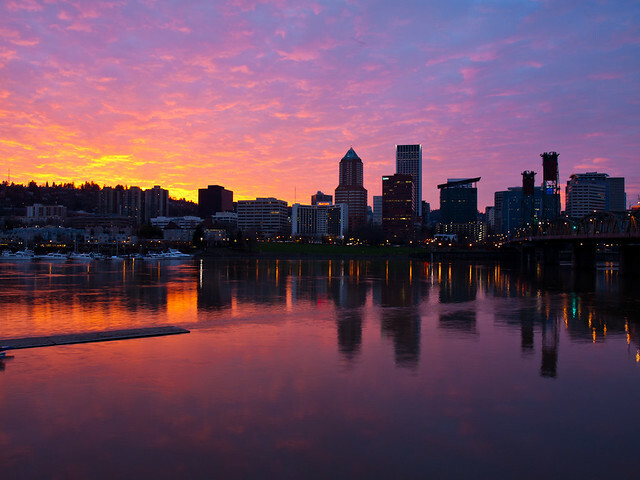 Just before dark, I drove over to the Eastbank Esplanade and set up for some more shots of the Portland skyline and the Williamette River. As the sun set, the sky began to light up with color. The Esplanade was busy with people walking and riding bikes, but a lot of them stopped to watch the sunset. And the city after dusk. 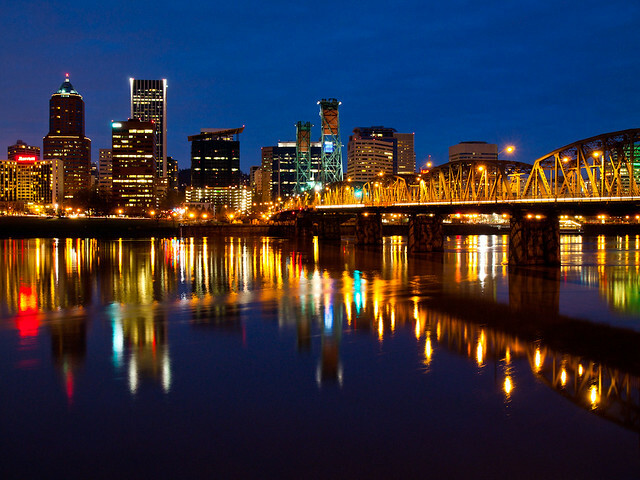 The bridge on the right is the Hawthorne Bridge, which opened in 1910. It's the oldest vertical-lift bridge in the country, and one of the busiest bridges in Portland. The next day, we were a bit lazy and ate lunch at Sizzle Pie and then made another visit to Powell's City of Books. 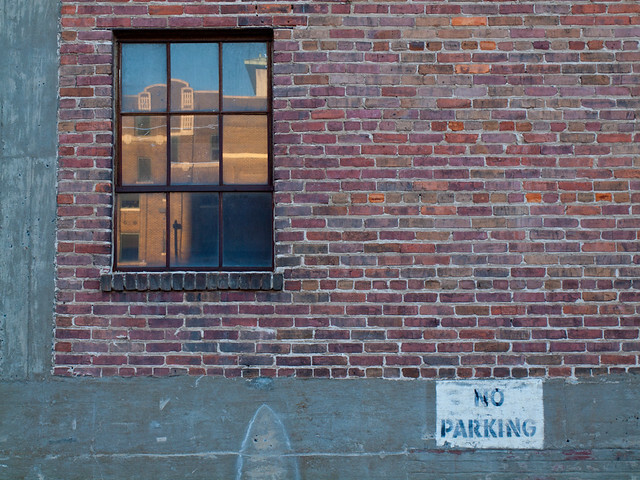 We drove by this parking lot, which was tucked under a building and guarded by a tree that was straining to get some sun. The next morning, we had breakfast at Besaw's and then took another drive out of the city. This time we headed west, towards the Pacific Ocean. Portland is perfectly placed, after about an hours worth of driving through the Tillamook State Forest, we were at the beach. 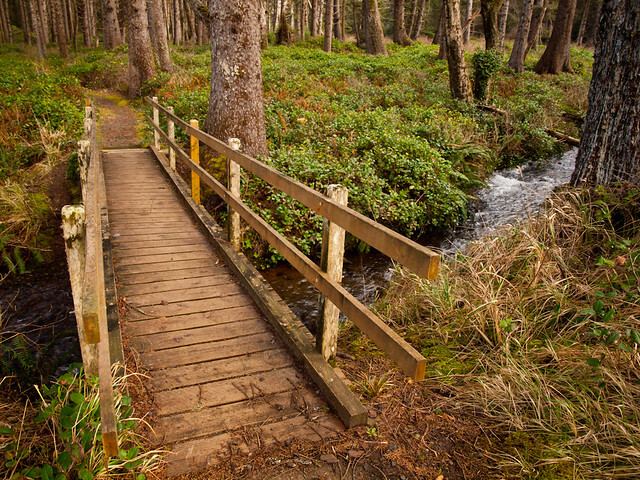 This was at Cape Lookout State Park, where this creek flowed out from the woods and right into the ocean. I'm used to the beaches of Florida, so it was an interesting change to see thick forests and bluffs along the beach. The bridge here carried a trail (the Oregon Trail?) over the creek that flows into the ocean in the above picture. From there we headed north and stopped at the Oceanside Beach State Recreation Site. 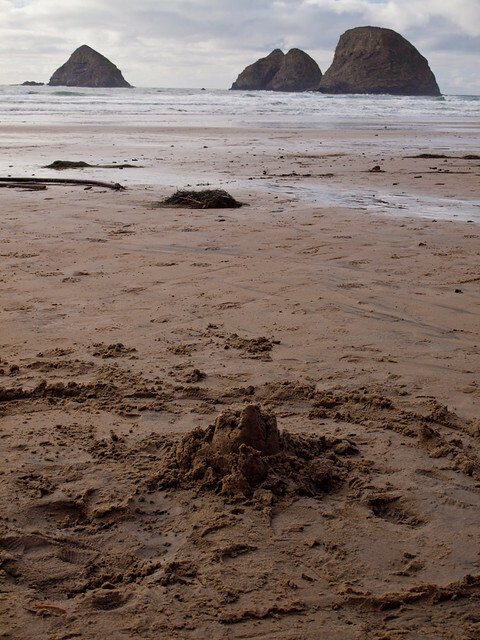 I was really excited when I saw this beach, because I assumed this was where they filmed the end of the classic film, "The Goonies." But it wasn't, unfortunately. That beach is actually about an hours drive up the coast. We took a few pictures here, and got a little soaked by some waves. The rocks here are actually called the Three Arch Rocks, and are protected as a National Wildlife Refuge. 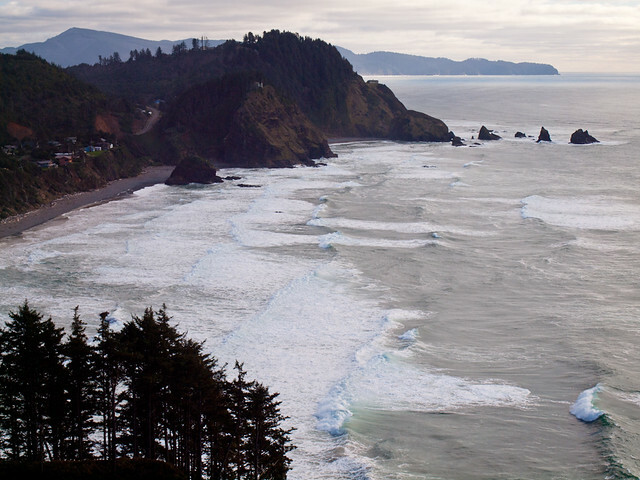 After that we drove north to the Cape Meares State Park. 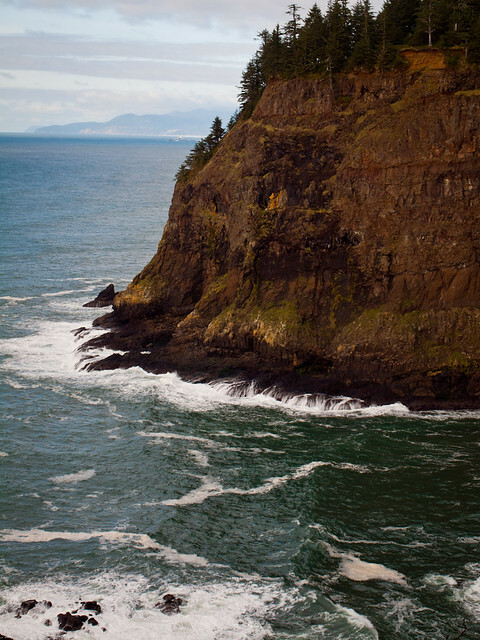 The park sits on above 200 foot tall bluffs, with the ocean crashing below. 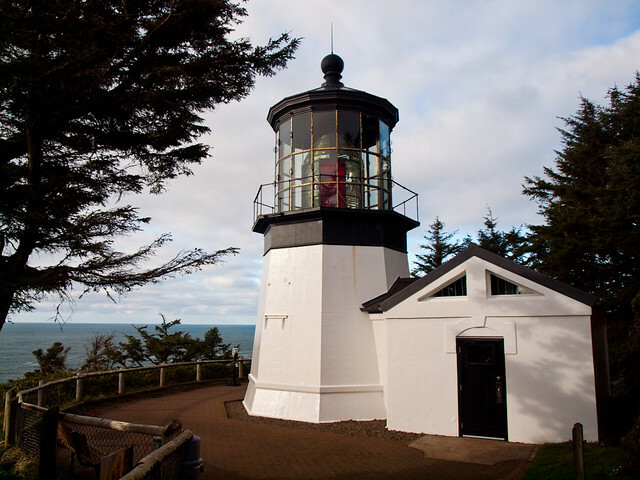 The lighthouse at Cape Meares was built in 1889, and deactivated in 1963. Like most old things in this country, it was nearly demolished. 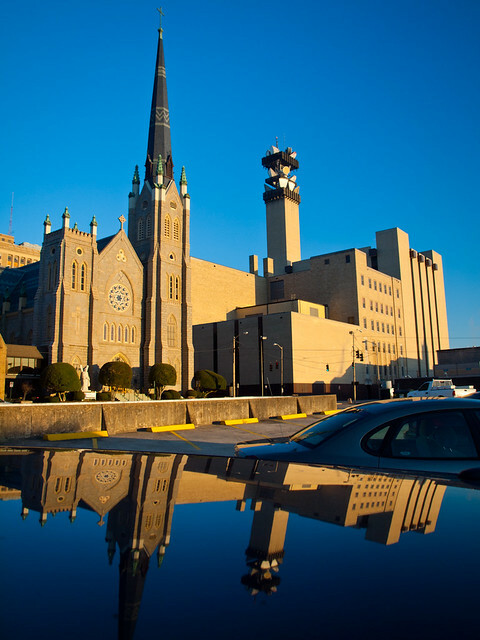 But there was a public outcry and the building was preserved. It's open to the public, but there has been a history of vandalism there. In 2010, some drunk idiots took their guns and shot up the lighthouse, ultimately causing nearly $500,000 in damages. We only shot a few pictures when we there. 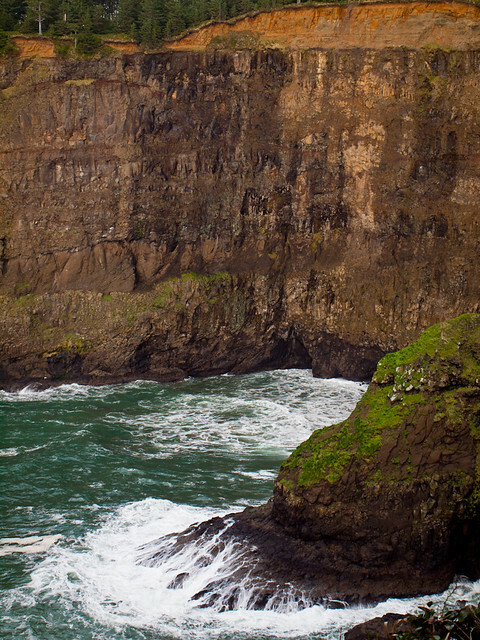 A trail followed the edge of the bluff, overlooking the ocean and the Three Arch Rocks. 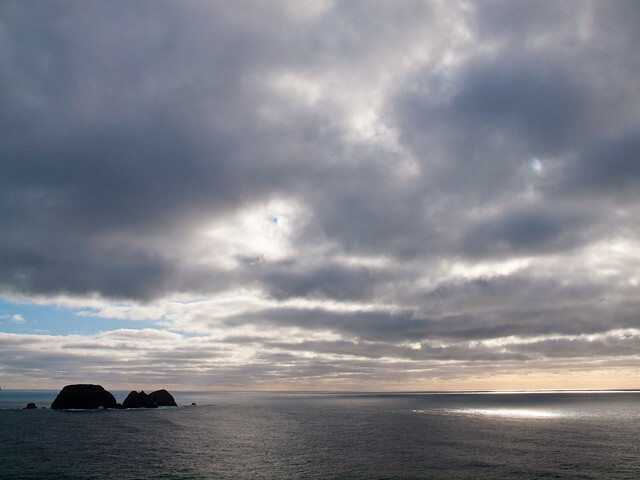 It was a partly cloudy day, and the sun managed to break through the clouds a few times. 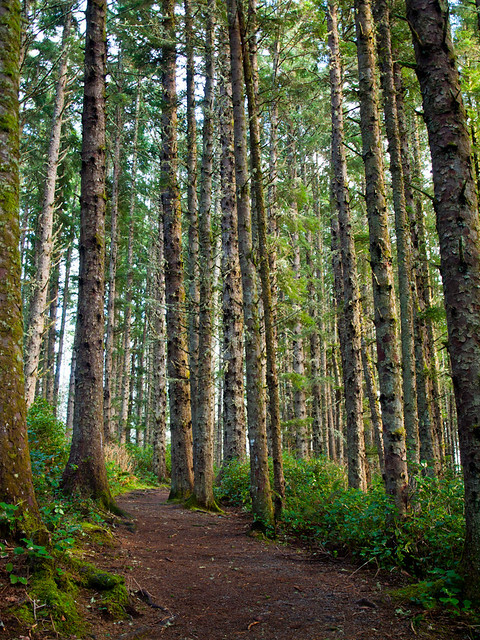 We followed a trail that led through a thick spruce forest, where we saw the only other people in the park. We then got back on the road, only to stop a few minutes later. A trail ran down the hill to the beach, right next to a waterfall. 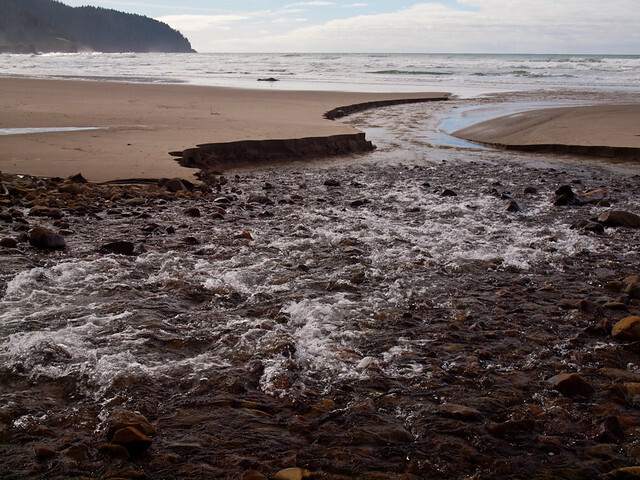 The waterfall created a creek that then flowed directly into the ocean. We took a few more pictures and then drove into the town of Tillamook, where we did a wine and cheese tasting before heading back into Portland. 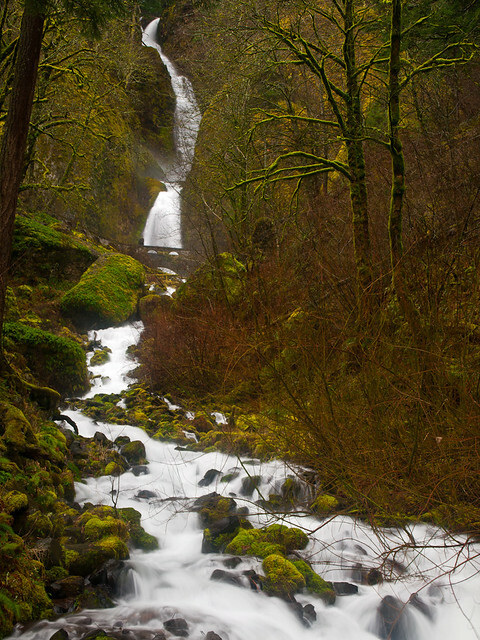 From Latourell Falls, we headed to the next waterfall along the Columbia Gorge Scenic Highway. Which is a great stretch of road. 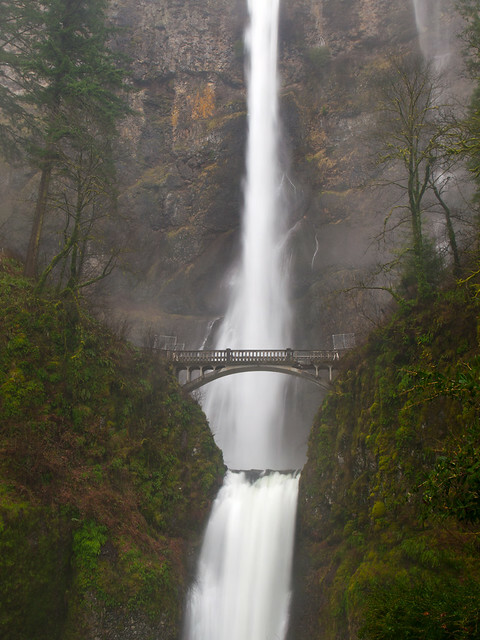 I think I would become very spoiled if I lived in Portland, since it's unfair to have a string of beautiful waterfalls along a short stretch of road that are incredibly easy to reach. We drove down the road and stopped at Bridal Veil Falls, which requires only a short walk down the hill to the creek and falls. There used to be a large mill here that diverted water from the creek, effectively draining all of the water from the waterfall. The mill ceased operation in 1930, but you can still see remnants of it in a few places around the falls. 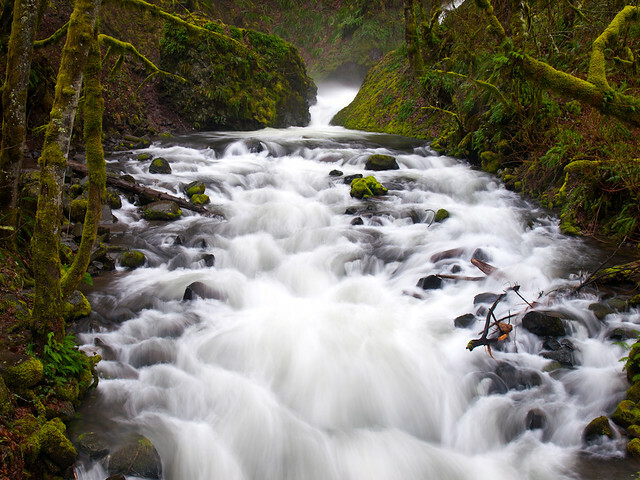 This is the view of Bridal Veil Creek, from a bridge along the trail to the falls. And a closer view of the base of the falls, taken while a light rain fell on us. 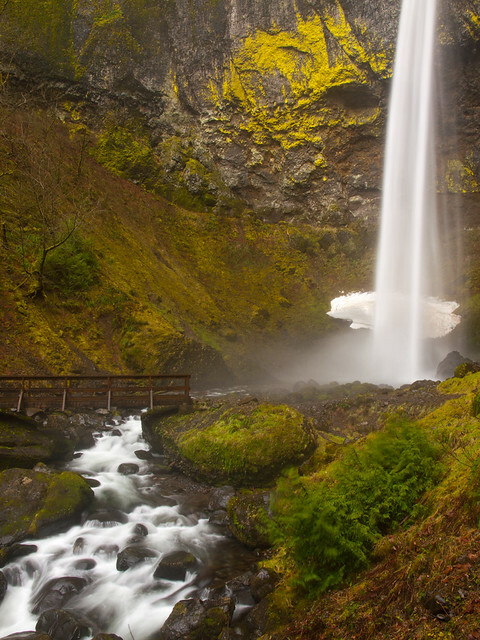 Our next stop was the mighty Multnomah Falls. 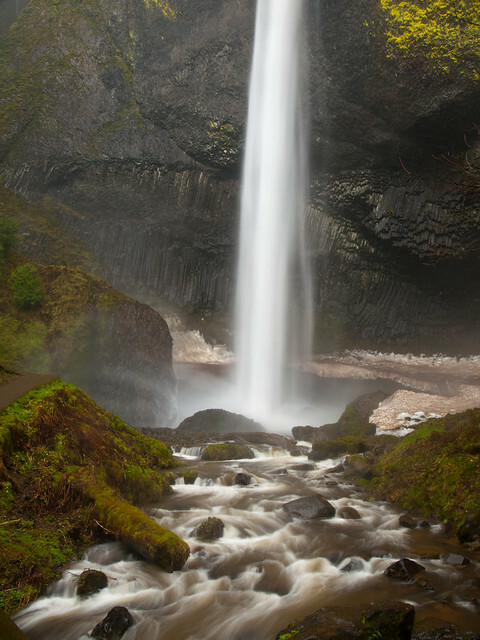 This is the tallest waterfall in the state of Oregon, with a total height being somewhere around 620 feet. It is also claimed to be the second tallest continually flowing waterfall in the country, but waterfall people will debate you on that one. No matter what, it's an amazing waterfall to see in person. The historic Benson Bridge, which was built in 1914 and stands above lower tier of the falls, was closed. Apparently someone or something dropped a massive boulder on it, punching a hole through the bridge. The Forest Service closed it until they can figure out how to repair it. I walked up the trail to the bridge to take a closer look. The hole in the bridge was big enough to swallow up a person, so I guess it was a good idea for them to block access. It started pouring down rain while we were there, which combined with the considerable spray from the falls made photography a wee bit difficult. I bought an umbrella from the gift shop and feebly tried to block the rain (which didn't work. All I really accomplished was getting pictures that were partially obscured by a blurry umbrella). This is one view of the falls, taken when I just about gave up trying to battle the elements. 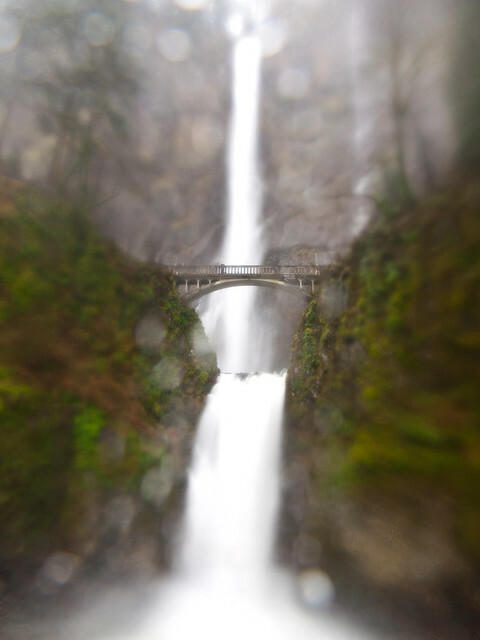 What looks like an Instagram filter is really about a minute's worth of water on the polarizing filter. 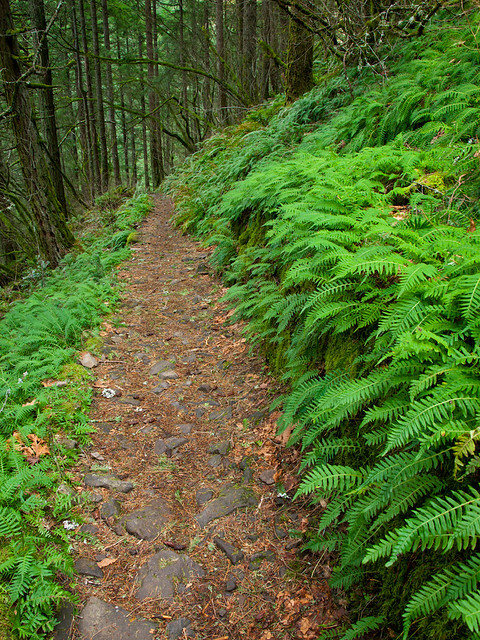 From there we headed to yet another waterfall, Wahkeena Falls. The name Wahkeena is a native American word, meaning "most beautiful." 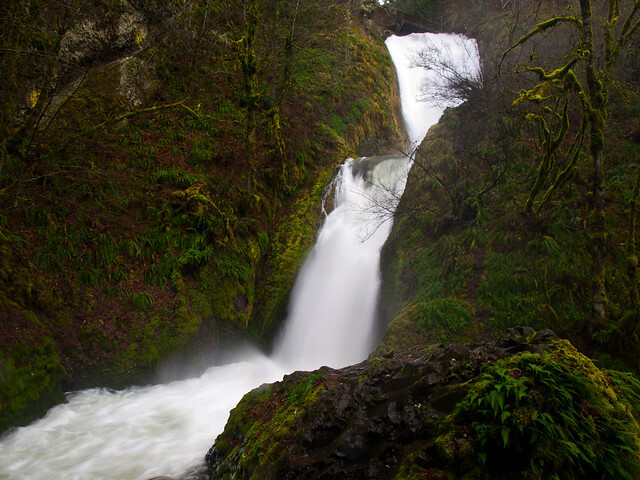 The falls are 242 feet tall, and the creek bounces and plunges down the side of the mountain. I walked up the steep paved trail that went up the hill to an old stone bridge that crossed the falls (it's about in the middle of the falls in the above picture). The spray from the falls soaked me and the camera, and none of the pictures turned out. The next and final stop we made that day was Horsetail Falls. This is an incredibly easy waterfall to reach, since it's just about 30 feet away from the road. 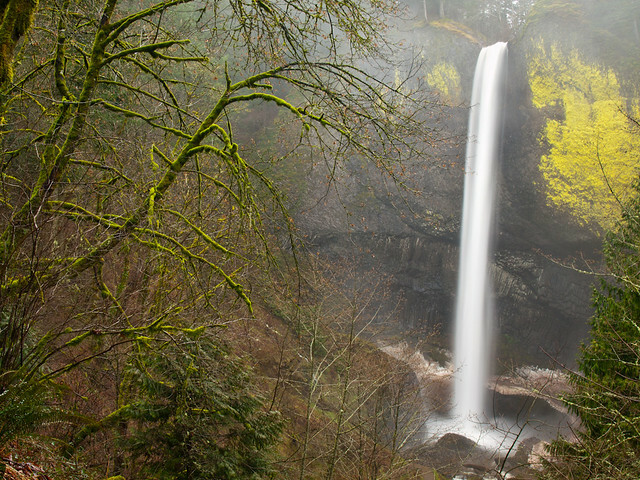 The 192 foot tall waterfall is aptly named since it does resemble a horsetail. But while it was easy to reach, it wasn't easy to photograph. The spray from the falls swept out like a curtain, quickly enveloping everything nearby (including my poor camera). I did manage this shot, in the one place that was safe from the mist and water (I think the tree was blocking it). After that it was beginning to get dark so we headed back into Portland. 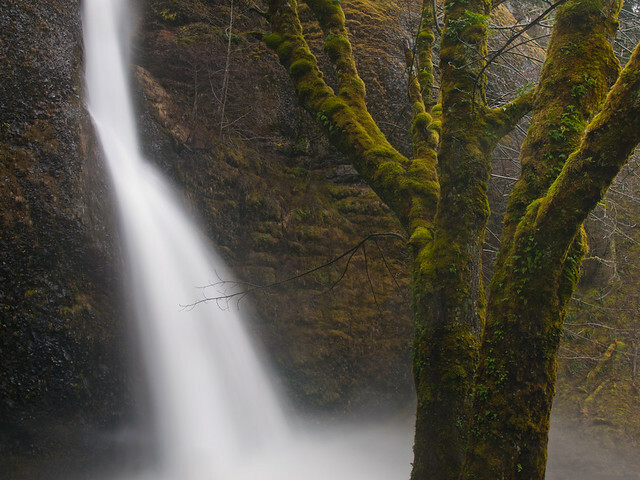 I know we didn't see all of the waterfalls in the Columbia River Gorge, but luckily we did have some free time later on in the trip to make a return visit. 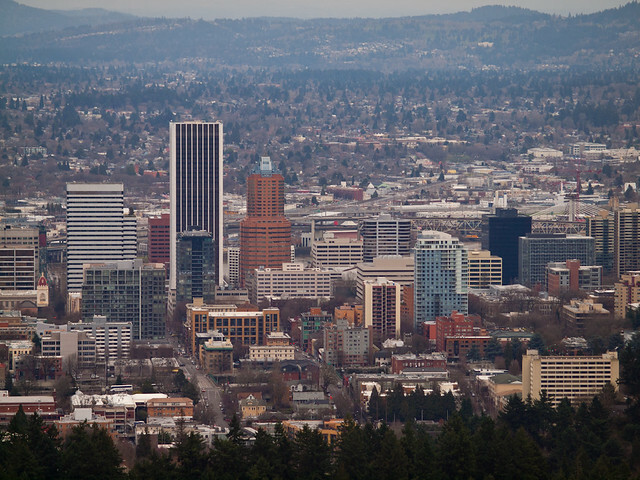 Last week, Caroline and I took a quick vacation to Portland, Oregon. It's a city that I've been wanting to visit for awhile. 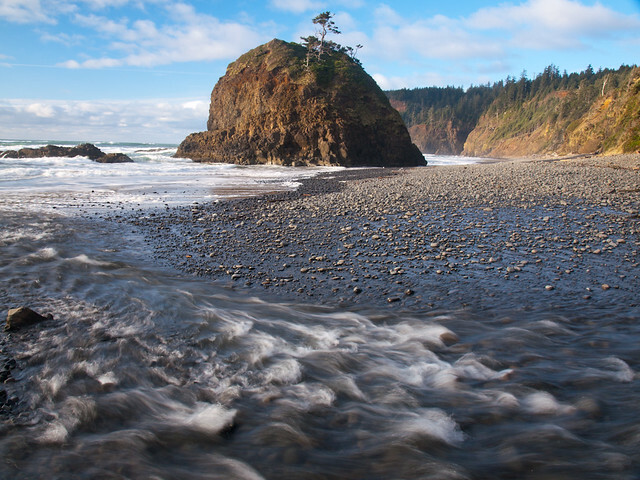 The city is surrounded by waterfalls, and the coast is about an hour away. 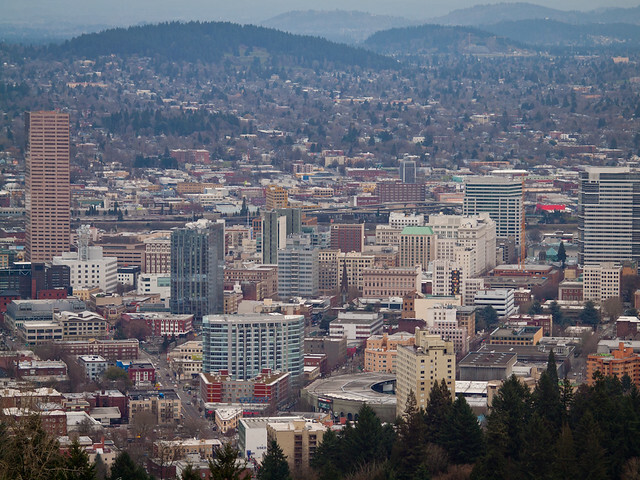 Portland is also home to more breweries than any other city on the planet. So after sitting on the plane for several hours, I was more than eager to get there. We got in late at night, but the next morning was perfect for waterfalls. 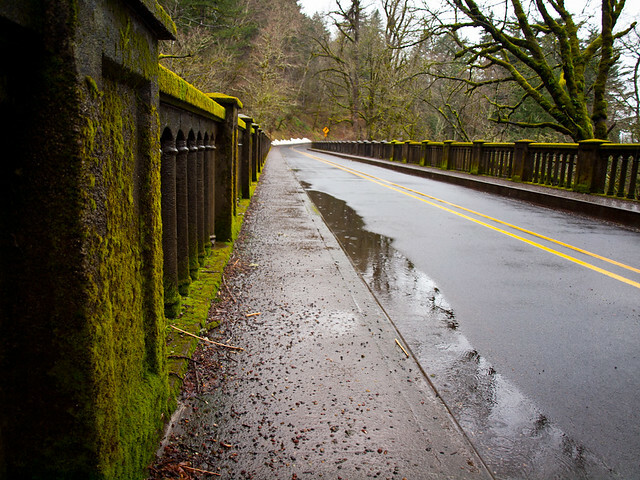 A steady rain fell as we drove east from downtown towards the Columbia River Gorge. We left the freeway and then drove the Historic Columbia River Highway, which runs for 75 miles from the Sandy River to The Dalles. 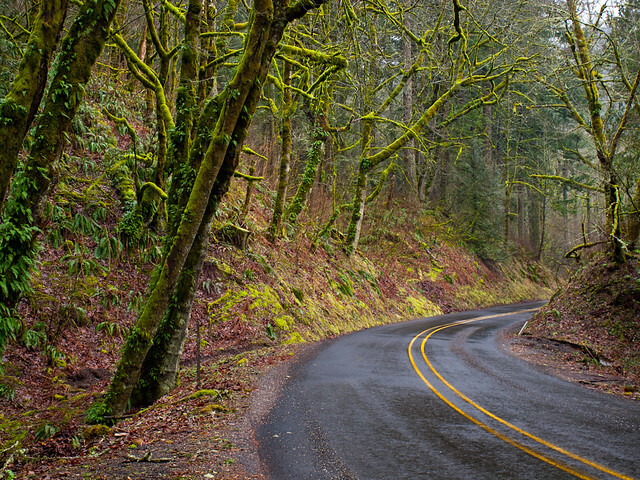 The road was built between 1913 to 1922, and curves and snakes through deep forests that are covered in layers of moss. 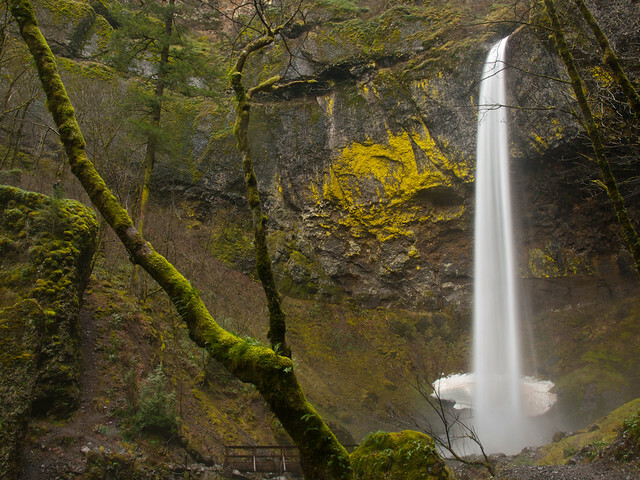 Our first stop was Latourell Falls, which you can see from the road. This is the bridge over the stream, downstream from the falls. There was moss everywhere. I'm surprised moss didn't start growing on the car while we were parked near the falls. The falls are amazing, dropping almost 250 feet. We hiked a trail that went uphill for a bit, which provided this view of the falls and the swirling fog and mist that surrounds it. I followed another trail that went along the creek and to the base of the falls. 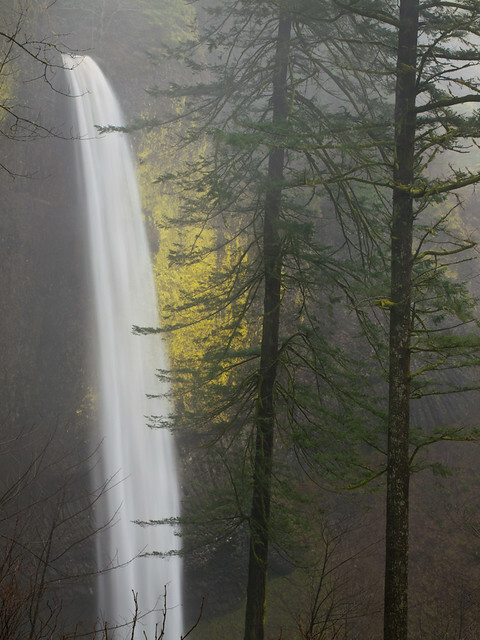 The trail was being bombarded by mist from the falls, soaking everything. It wasn't the first time that day that I'd be thankful that my camera bag is waterproof.